A lot of fulltime RVers who keep blogs use New Years to recap their adventures and travels. Some take stock of their new life style and evaluate whether or not it was a prudent choice for them. I don't think you will find too many admitting to having made a mistake. It is not in human nature to broadcast to the world that they screwed up. Most won't even attempt an evaluation. They will just do the old slide show of the family trip. Since we have been at this for only seven months, I'll spare you the boring recapitulation for now; but come June 5th, look out. (Or, maybe not). Our most recent lesson? We don't want to be this far north in the winter. Especially during arctic blast outbreaks! We are in South Carolina, the Sunny South. So where is everyone? 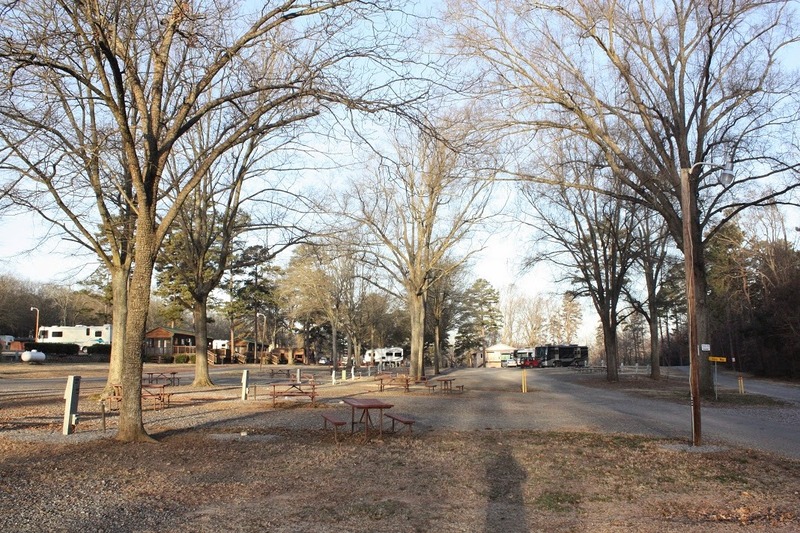 There are only a handful of RVs in this campground on this sun-filled weekend. Most of our neighbors have come in after dark and leave at first light headed south on I-77. Their toads are white with road salt. This place is still too cold for the snow birds. • RV's, even luxury motor coaches, are not very well insulated so you have to run furnaces and heaters. They are noisy and expensive to run and you waste time worrying about running out of propane. • The outdoor temperature must be monitored closely so that water connections can be severed and protected before damage is done. (We have a new standpipe and spigots on our water connection because the campground didn't turn off the water correctly the other night and the pipe burst. When water freezes it expands and even steel will not contain the sudden expansive force). At the end of the day, Joanie has to hurry up and get the dinner dishes washed up so that I can run out, shut the water off, drain the hose and stow it, turn the valve to the internal fresh water tank and be sure the drop-light in the wet bay is on making some heat to protect the plumbing system. • Northern latitude solar exposure is insufficient in winter to keep the old bones and mental processes happy. The sun only gets to about 40 degrees above the horizon here in Fort Mill, SC (not even half way up the sky) before it starts going back down. It is even worse for folks farther north. So the lesson is: if you have wheels under you, use them. Next year when we do our New Year's recapitulation we will be farther south. Lesson learned! Hi Robert! Just wanted to thank you for taking the time to write the blog. My family is planning on shoving off this summer and your posts are so helpful and inspiring. Lots of luck this winter!